It’s nearing the end of the school year and it’s my son’s last day to bring a snack to share with his Pre-School class, so I thought we would make it a good one. I had a few fun ideas filed away and when I told my son about them, he definitely wanted to make Butterfly Snacks. I first saw these cute Butterfly Snacks in Family Fun Magazine, but have since spotted several versions on Pinterest using all sorts of fun snack combinations. You can use the same snack in both wings, different snacks of the same color in each wing, or just put different snacks in any color in each wing for the kids to enjoy. 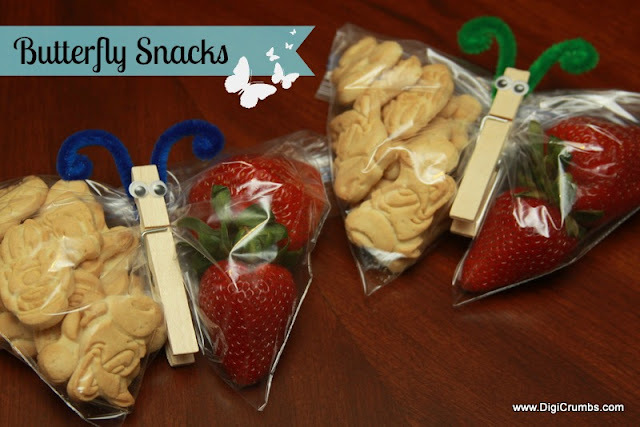 Of course some snack combinations will make the butterflies look more realistic than others, but I just love that you can include two different snacks in the same bag separated by a clothespin...functional and cute! I left my son pick the snacks he wanted to share with his Pre-School class. He chose a couple of his current favorites, Strawberries and Organic Animal Crackers. Not a combination I’ve seen made into Butterfly Snacks before, but we’re always up for a challenge. First glue the googly eyes to the clothespins, so they have time to dry. Then cut the pipe cleaners in half and shape the antenna. Next it’s time to fill the bags with snacks. We bought the snacks in bulk sizes at Costco, so we had more than enough. First fill each bag with a serving size of animal crackers. I wasn’t sure what to do with the strawberries, so they would look like a butterfly wing and be easy for the kids to eat. I considered cutting them, but decided to see how the Butterfly Snacks looked if we used whole berries. After washing the strawberries, lay them out to dry. Put a larger berry on top and a smaller berry on the bottom (stems touching toward the center). Close each plastic bag, fold the ziptop to the back, and pinch the bag together between the two different snacks. Clip a clothespin in between the snacks and insert the antenna pipe cleaner. A tray full of beautiful Butterfly Snacks to share...not bad with a 4 year old and newborn baby! I like the natural wood look of the clothespins, but if I make these again it would be fun to try decorating the clothespins with patterned scrapbook paper, paint, markers, or even washi tape. Update: These were a big hit with the Pre-School class. I may have to make these again for my sons class next year!